Do you know that if you accept Jesus Christ as your Saviour then you are adopted into God's family? You might have heard that. But I was thinking about this and I realised that often we live, not as if we've been adopted into His family, but as if we've been fostered into His family. When you are fostered, you live with your new family, you are welcomed into their home and their lives, you might even enjoy some of the benefits of your new family. Most of the time it might feel like they are your family. They provide you with shelter, clothing, food - they often love you as if you were their own. But they are not your family. You still retain your identity from your previous family. And at any point your old family could come back and claim you as their own, removing you from your new family (and rightly so, in most cases!). When you are adopted you live with your new family, you are welcomed into their home and their lives, you enjoy all of the benefits of your new family - including an inheritance. You feel like this is your home. They have provided you with shelter, clothing, food; they love you as if you were their own, unconditionally, forever, no turning back. And here's the key: you are given a new identity. When you are adopted you are given an adoption certificate - with your new name and your new parents detailed on it. This replaces your birth certificate and is used for all official purposes! The old you ceases to exist in the eyes of the law! When you are adopted into God's family, you receive a new identity. It's for forever. It's a clean slate. A new life. No one can take that away from you! God has claimed you as His own and He's not turning His back on you! The old has gone, the old has ceased to exist, the new has come, you are a new creation! Yet we live as if we are merely fostered. We enjoy some of the benefits of our new family but we keep going back to our old lives. We beat ourselves up for what we've done in the past, we cling to old hurts, old shame, things that we need to leave buried. We don't live in our new identity! God's not going to give up on you and send you back to the orphanage. The enemy has no claim on you as if he can walk back into your life and claim you as his own - you are God's. You have a new identity. You are a new creation. You are His heir and will inherit the keys to the kingdom! When we realise this we will stop living in the past. We will live with confidence, free from shame, free from whatever has gone on in our past. 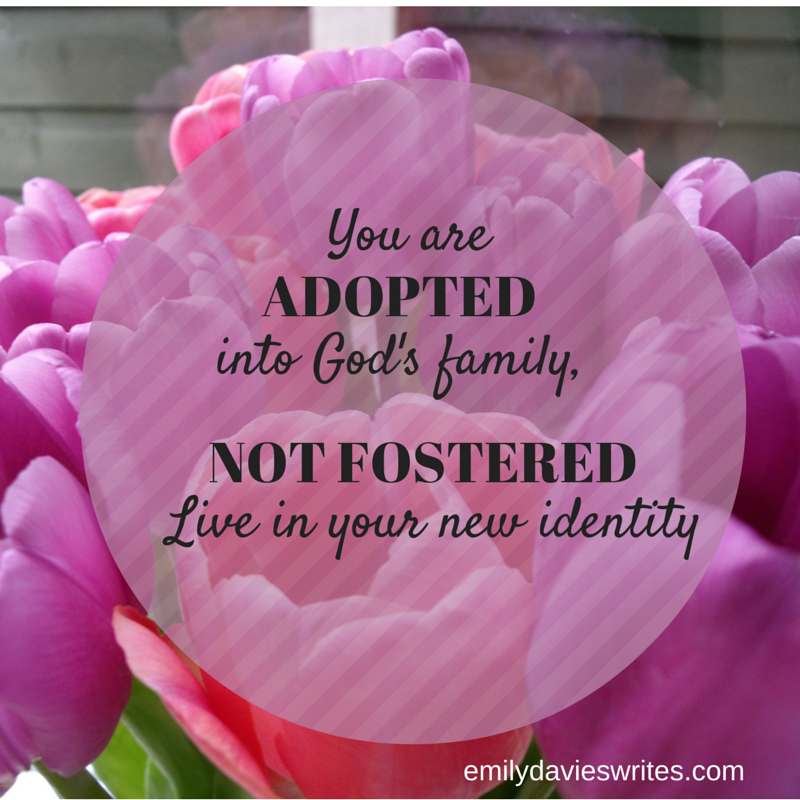 Are you living as if you're fostered or adopted into God's family? I have such a hard time getting my head around this, I don't know why. I mean, I know it logically but feeling it in my heart seems to be taking so much longer and be so much harder. I don't if perhaps because I am 'alone', my husband and son aren't on this journey with me, merely watching me and I worry about leaving them behind.